Once, in the bulk goods aisle of the Park Slope Food Coop, a wild-haired woman stood next to me and scrutinized the coffee-grinder settings. “I’m using it for an enema,” she explained. “It needs to be very fine.” I suggested the espresso grind. This is exactly the kind of shopping experience I hoped for when I joined the Park Slope Food Coop in the fall of 2009: a realization of the eternal promise of New York, home of the strange. (That and crazycheap organic food.) Founded in 1973, the Coop is a Brooklyn institution with enough character to have spawned its own genre of trend piece. Some examples: the Coop has Byzantine rules and work requirements (debatable); the Coop has nannies covering their employers’ shifts (dubious); and, most recently, the Coop is becoming a hotbed of anti-Semitism (downright wrong). The New York Observer has contributed the latest addition to the genre, with a smug piece earlier this month devoted to Coop members’ efforts to initiate a boycott of Israeli products and divest from whatever Israeli holdings the Coop might have. 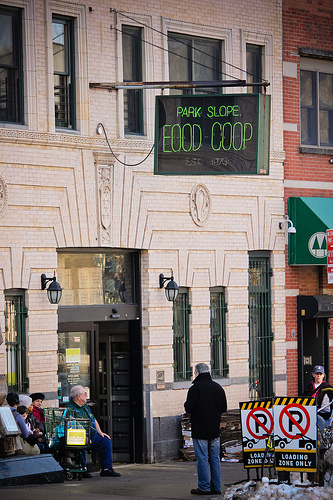 At the historically progressive Coop, the Observer procured a chorus of sources declaring the campaign anti- Semitic and intolerable in “the heart of Chaimtown,” as one man put it, referring to Park Slope’s high Jewish population. For the full sensationalist effect, Alan Dershowitz—the de facto representative of the hawkish Israel-right-or-wrong Jewish establishment—denounced the campaign’s “bigotry” and threatened to shut the joint down, an ambitious goal for a Cambridge, Massachusetts, resident who is not a member of the democratically-governed Coop. Leading the charge against BDS at the Coop is Barbara Mazor, who told the Observer, “I think [BDS supporters are] latching onto it like slogans. Like true believers, it’s the cool thing to do. You know, ‘I’m a progressive, and it’s a progressive cause,’ so I think that’s how it’s coming through, very thoughtlessly.” (Mazor also alluded to her otherwise liberal politics with a dig at “a certain president [who] spent eight years in office.”) The political alignment of the Coop’s BDS opponents is made clear on their website, which links to the reactionary pro-Israel group Stand With Us, known for having once pepper sprayed anti-occupation activists from the group Jewish Voice for Peace, along with having published an anti-BDS comic book that depicted Palestinians as vermin, in a throwback to Nazi propaganda. In a letter published in the Coop’s house organ, the Linewaiters’ Gazette, boycott organizers noted that the Coop has a long tradition of boycotts—of both individual companies and entire nations. A 20-year boycott of South African products began in 1973, the year of the Coop’s founding. There have been eleven Coop boycotts since 1989, including Coca-Cola, Domino Sugar, non-United Farm Worker grapes, and tuna. Until recently, the matter of boycotting and divesting from Israel had only been raised in letters in the Linewaiters’ Gazette, where the debate has ebbed and flowed for over two years. But at a July 26th general meeting—a monthly gathering held at Brooklyn’s Congregation Beth Elohim—the grinding wheels of Coop democratic process began turning with the first face-to-face discussion of BDS. The question at hand was not whether or not the Coop should join BDS, but rather whether they should even hold a membership-wide vote. “Why not boycott Syria, Saudi Arabia, or Bahrain?” said Susan Tauber, one of the members advocating against the referendum, according to the Linewaiters’ Gazette’s recap of the general meeting. Coop BDS organizers told me that almost all of the supporters who spoke at the meeting were Jewish and identified themselves as such. Still, Jewish opponents of BDS at the Coop show that the “progressive except Palestine” phenomenon in the American Jewish community has not gone away. While open to hosting the debate in his synagogue, Congregation Beth Elohim’s Rabbi Andy Bachman—generally considered a progressive rabbi—condemned the boycott efforts in a statement, writing, “BDS rhetoric reveals that the ultimate goal of the majority of its supporters is a dissolution of Israel as a Jewish state. This is simply untenable and unjust.” (Bachman was referring to BDS’ demand that Palestinian refugees be allowed to return to what is now the state of Israel in accordance with UN Resolution 194.) In the Linewaiters’ Gazette, BDS opponent Ruth Bollettino made the same argument, but in starker language. “The ‘right’ of Palestinian refugees to return means dismantling the Jewish state demographically, flooding it with Palestinian Arabs,” Bollettino wrote, revealing the racial fears underpinning the drive to maintain Israel as a Jewish-majority state. Her letter joined seven others against BDS, one in support of BDS, and an unrelated letter thanking a stranger for having returned $90 that had fallen out of the writer’s pocket at the Coop entrance. Boycott supporters at the Coop would seem to be in the minority, if one were to judge by the letters in the Linewaiters’ Gazette or the Observer, which admitted its nonscientific methods while noting, “Finding pro-boycott members outside the co-op Monday night was no easy task.” But Melissa, a Brooklynite Coop member of eight years, had a different impression of the membership’s stand. “The silent majority of Coop members are probably uncertain about the issue of BDS,” she said, adding, “The challenge that we have is not to change the minds of people like Barbara Mazor.” Rather, it is to educate their fellow Coop members as to the need to honor the Palestinian BDS call. In a certain sense, the Coop campaign is dealing with liberal people who just want to get their crunchy, hippie food and be left alone. But the best things that movements critical of Israel can do is to push people to be consistent. Consistency is a great thing to offer people. It requires some explanation and education as to why this is part of your other values–why boycotting or divesting from Israel is an extension of them. Read on to my next installment, in which Jesse and I go shopping at the Coop to see what products could go inside the Israeli boycart. Kiera Feldman, a Brooklyn-based journalist, has reported for The Nation, Mother Jones, n+1, PRI’s The World, AlterNet and Killing the Buddha. Follow her on Twitter. Perhaps this is why many Jews (and plenty of Gentiles) aren’t so happy to support the BDS? It all comes down to religious violence. It isn’t about territory, its about which magical god one chooses to believe in and how groups continue to kill one another in the name of their personal deity. Hi David, thanks for your comment. I have to disagree, though. Research shows that the violence you are referring to has very little to do with religion. According to anthropologist Scott Atran, who studied tens of thousands of would-be terrorists and their supporters, religious education is a negative indicator of terrorism. The main source of motivation for terrorist activity is moral outrage – be it the killing Palestinians by Israeli forces or the conditions people are forced to lived under. While there are deaths on both sides of the Palestine/Israel divide—and all are tragic—one must recognize that Palestinians are paying the greater toll, which is no doubt fueling Atran’s point. University of Chicago professor Robert Pape also disputes the claim of religion as a motivating factor for violence. He created a database on every suicide bombing from 1980 to 2004 and found that, rather than being driven by religion, the vast majority of suicide bombers — responsible for over 95% of all incidents on record — were primarily motivated by a desire to compel a democratic government to withdraw its military forces from land they saw as their homeland. The biggest misconception about the rise of religious activism? That there is something wrong with religion. The global rise of religious rebellion is not about religion—at least not in the narrow sense of fighting over theology or religious beliefs. It’s about social order and a perceived threat to their way of life. Most of the people I interviewed were not all that pious—they felt that their people were under attack and they were excited about joining the fight. When went to prison to interview one of the Muslim jihadi activists involved in the 1993 World Trade Center attack, I was surprised how ordinary he seemed—using mild profanity and expressing an interest in blond-haired women. But he was passionate about what he perceived as injustice against the Muslim world. He discusses these issues more in my interview with him at The Immanent Frame. Thank you. I know we are both of good will and can respect each other’s positions on religion and religious violence. Looking at the first link, it appears, like any blog (yours and mine, too) that the opinions shared are not tested but are the thoughts of the writer. Moral outrage, in essence is subjective as all morality is subjective. So to say that moral outrage is justification for violence is a poor argument and one that is very un-King and un-Gandhi-like. I believe that Dan Berrigan would agree with this since he abhors violence, but not the witnessing and non-violent action to bring change in any social struggle. The problem with religious terrorism, be it Christian, Jewish or Islamic, et al, is that the forces of violence will always justify their right to hurt others based on their reading of their religious texts or from leaders in their religious communities. However, as authors like Sam Harris have pointed out, for the extremist, any action taken by an infidel, real or imagined can be interpreted as a “moral affront” and therefore dealt with violence. As Harris (and many others) have also pointed out and I am paraphrasing, the folks who flew the planes into the Twin Towers were on Jihad, thus, sanctioned religious violence is real and cannot be whitewashed by believers of any faith. Sorry, no moral outrage, unless it is religiously based, will cause people to fly planes into buildings and kill more than 3,000 people. Regarding your second point. Let me say that I do not partake in any religion, nor do I feel an alliance to any country other than the United States. However, past and present religious violence, especially that of the Semitic religions of Judaism, Islam and Christianity, against women and people other faiths is real. Yet the political Christian left seems to dismiss and/or accommodate objections or call those who object to such violence xenophobic or racist. So the left will always look at “first-cause” or whatever place in history one needs to cherry-pick statistics to justify the violent actions of those who they see as allies in a struggle. Knowing Pape’s work as I do, I frankly do not trust his statistics and he is seen as someone who comes to the table with a set of philosophic beliefs that pre-dispose and biases his research for conclusions which may not stand up against larger trends. Lastly, in my opinion, research about the European non-violent response against Hitler is historically inaccurate, revisionist and not very good scholarship. While the historical record shows that one or two countries and a few towns used a non-violent strategy against Hitler, the fact that Hitler’s war machine was fighting a war on two fronts made it impossible for him to clean them out. Something he surely would have done had the Nazi’s won the war. You cannot point to a minority action and say, “Here see, non-violence would have worked.” It is an ignorant position and one that defies the historical record and facts of the conflict. Which, by the way Hitler used religion and the New Testament to purge and kill six million Jews as well as six million others, including homosexuals, non-violent priests and so many ethnic minorities. Ouch! Howdy! I could have sworn I’ve visited this site before but after going through many of the articles I realized it’s new to me. Regardless, I’m definitely happy I discovered it and I’ll be bookmarking it and checking back frequently!